Meghan Trainor is a Grammy-winning singer whose claim to fame is dancing sassily in music videos for fatally empowering pop songs like “All About That Bass” and, most recently, “No.” Sam Smith is a Grammy-winning, incessantly-shrinking artist who won this year’s Best Song Oscar for the Bond ballad “Writings on the Wall,” which is a song. These two chummy vocal-chord-surgery-having singers should stop lying to themselves and experience the unsustainable standard of living we call wedded bliss. 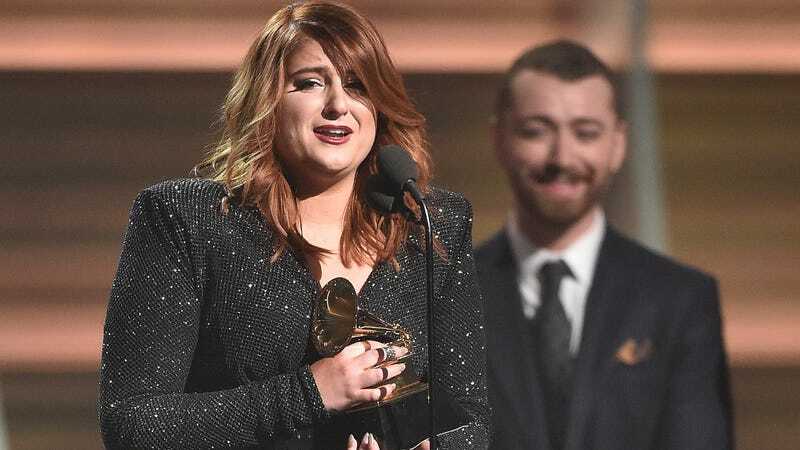 Last year, Trainor cancelled her tour to undergo surgery for a hemorrhaged vocal chord, at the behest of Sam Smith, who advised her to protect her instrument at all costs. After all, he was speaking (because he finally could, after the surgery) from experience. It didn’t not work. Meghan’s voice is no less decent than it was before. No doubt, they’re mutually obsessed, with (likely) deeply disturbing dreams about collaborating with each other. How about collaborating on a song—and a wedding ceremony. Yes, Meghan and Charlie Puth caused an atomic explosion of mediocrity when they kissed on stage last year, but that meant nothing because they’re just friends. Sam Smith is openly gay—an insignificant detail—and has shared various social media posts about his ex-boyfriend. So? The evidence for this ’shipping is overwhelming. Trainor told Digital Spy in January 2015, “He’s a big fan of ‘Sledgehammer,’ a song I wrote for Fifth Harmony, and he didn’t know I wrote it for them. I was like ‘Yo, I wrote that,’ and he was like, ‘What?’ and I was like, ‘Yeah, I’m a writer.’” And I was like, whoa, yo, they should get married. Even though Meghan and Sam are pitted against each other at the Grammys — where they’re both nominated for Record of the Year and Song of the Year — Meghan insists she’d love if the “Stay With Me” crooner nabbed the trophy. “If I don’t win those I want him to win those. I want him up there. I love him so much,” she gushed. A love that visibly sizzles. While it’s unclear how much Sam Smith loves Meghan back, one thing is certain: marriage is destined. They could be the next Bey Z, or better yet, Rob and Blac Chyna.